Under the APGIII system of classification, the Family Xanthorrhoeaceae contains the disparate sub-families Asphodeloideae (Asphodelaceae), Hemerocallidoideae (Hemerocallidaceae), and Xanthorrhoeoideae. Flowers are typically carried on a leafless stalk arising from a basal rosette of leaves. Individual flowers have stalks (pedicels) and there is a disk of woody tissue (hypostase) at the base of the ovule. The presence of anthraquinones in members of the Xanthorrhoeaceae is a unifying biochemical characteristic. 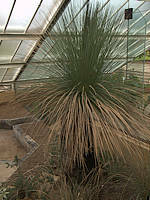 The Sub-Family Xanthorrhoeoideae contains a single woody Australian genus, Xanthorrhoea (Grass Trees). This genus includes 28 species of woody, flowering monocotyledons, which may be trunkless or with erect, thick trunks covered with persistent dead leaves and crowned with long, narrow leaves. Wild trees under 30 inches tall rarely flower except in extremely favourable conditions. The flower spike is the growing point, so flowering promotes production of multiple heads. Endemic to Australia. 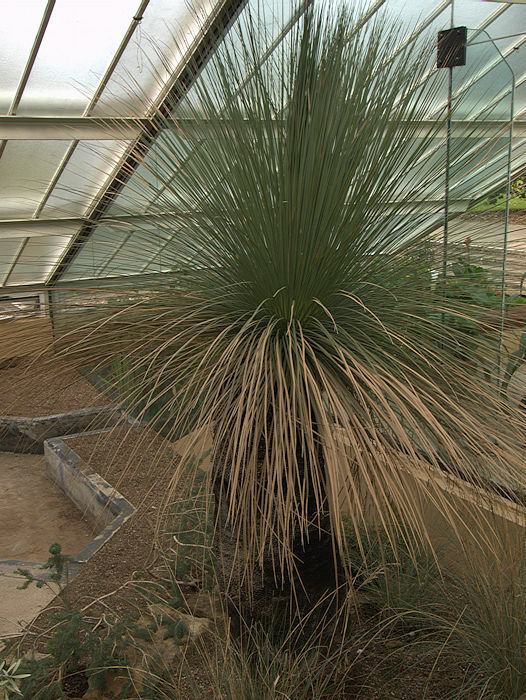 Grass Trees are adapted to bush fires which can stimulate flowering, but burn off the dead leaves along the trunk. The trunk grows over 20ft tall with many branches topped with a whorl of many narrow blue-grey 3 ft long leaves with a diamond to wedge-shaped cross section. Growth is very slow with an annual increase in height of only an inch. The inflorescence is a 6 ft brown spike covered with honey-scented cream flowers which are attractive to ants, birds, bees and butterflies. Flowers are followed by brown seed capsules containing small numbers of black seeds. Native to a large portion of the coastal region of Eastern Australia and can occur in large stands. 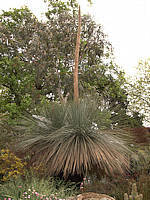 Severe frosts are common across this range and this grass tree is hardy to 20°F. 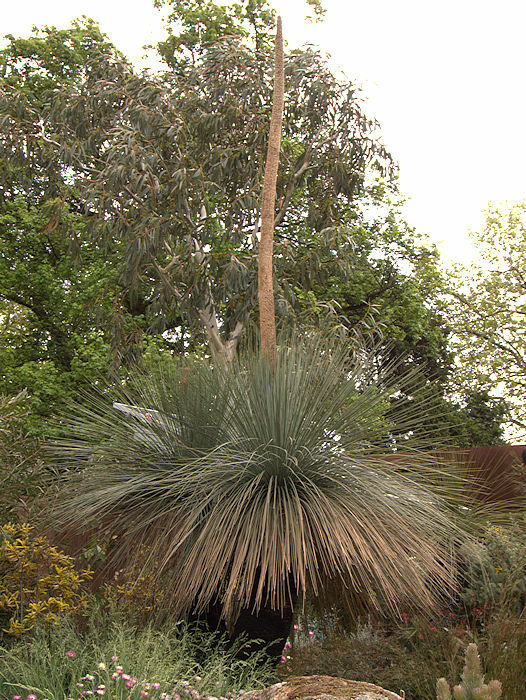 This flowering grass tree was part of an exhibit at the Chelsea Flower Show 2014. The thick blackened trunk can grow over 15 ft tall, taking a decade to start to develop, and consists of a mass of old leaf bases held together by natural resin and with a fibrous core. In its habitat outer surface becomes blackened by bush fires. The trunk is crowned with a dense clump of long, narrow leaves that with age become very hard yet flexible. A shallow root system provides anchorage and has symbiotic mycorrhiza fungi which assist nutrient uptake from poor soils. The inflorescence is a long, dense spike covered with small honey-scented cream flowers which are followed by capsular fruit. The flowers are attractive to ants, birds, bees and butterflies. Native to Eastern Queensland and North-Eastern New South Wales, Australia, growing on well-drained gravelly or sandy soils on open forests and heath. A mature grass tree takes many decades to grow and can live for 600 years.